In today’s global marketplace there has never been more pressure on organizations to reduce costs in order to be competitive. No longer can an organization afford to ignore the ever-escalating costs associated with increasing complexity and the lack of visibility of network traffic. Time is money! A great deal of time is spent on painstaking and often unsuccessful searches for the causes of performance and security incidents and monitoring inappropriate network use and risk. Applications continue to grow in complexity and have ever increasing bandwidth. Network infrastructure is growing and increasing in cost and complexity. NetFlow can provide the visibility that reduces the risks to business continuity associated with poor performance, downtime and security threats. As organizations continue to rely more and more on computing power to run their business, transparency of business applications across the network and interactions with external systems and users is critical and NetFlow monitoring simplifies detection, diagnosis, and resolution of network issues. Traditional SNMP tools are too limited in their collection capability and the data extracted is very coarse and does not provide sufficient visibility. Packet capture tools can extract high granularity from network traffic but are dedicated to a port mirror or a per segment capture and are built for specialized short term captures rather than long historical analyses as well as packet based analytics tools traditionally do not provide the ability to perform forensic analysis of various sub-sections or aggregated views and therefore also suffer from a lack of visibility and context. By analyzing NetFlow data, a network engineer can discover the root cause of congestion and find out the users, applications and protocols that are causing interfaces to exceed utilization. They can determine the Type or Class of Service (QoS) and group with application mapping such as Network Based Application Recognition (NBAR) to identify the type of traffic such as when peer-to-peer traffic tries to hide itself by using web services and so on. NetFlow allows granular and accurate traffic measurements as well as high-level aggregated traffic collection that can assist in identifying excessive bandwidth utilization or unexpected application traffic. NetFlow enables networks to perform IP traffic flow analyses without deploying external probes, making traffic analytics cheap to deploy even on large network environments. Understanding the benefits of a properly managed network might be a cost that hasn’t been considered by business managers. 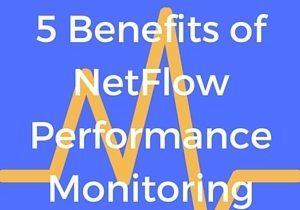 So what are the benefits of NetFlow performance monitoring? Service outages can cause simple frustrations such as issues when saving opened files to a suddenly inaccessible server or cause delays to business process can impact revenue. Downtime that affects customers can result in negative customer experiences and lost revenue. Slow network links cause severe user frustration that impacts productivity and causes delays. As the business grows, the network needs to grow with it to support more computing processes, employees and clients. As performance degrades, it can be easy to set thresholds that show when, where and why the network is exceeding it’s capability. By having historical performance of the network, it is very easy to see when or where it is being stretched too thin or overwhelmed and to easily substantiate upgrades. Security analytics is arguably the most important aspect of network management, even though it might not be thought of as a performance aspect. By monitoring NetFlow performance, it’s easy to see where the most resources are being used. Many security attacks drain resources, so if there are resource spikes in unusual areas it can point to a security flaw. With advanced NetFlow diagnostics software, these issues can be not only monitored, but also recorded and corrected. NetFlow analytics allows organizations to embrace progressive IT trends to analyze peering paths, or virtualized paths such as Multiprotocol Label Switching (MPLS), Virtual Local Area Networks (VLAN), make use of IPv6, Next Hops, BGP, MAC Addresses or link internal IP’s to Network Address Translated (NAT) IP addresses. MPLS creates new challenges when it comes to network performance monitoring and security with MPLS as communication can occur directly without passing through an Intrusion Detection System (IDS). Organizations have two options to address the issue: Implement a sensor or probe at each site, which is costly and fraught with management hassles; or turn on NetFlow at each MPLS site and send MPLS flows to a NetFlow collector that becomes a very cost-effective option because it can make use of existing network infrastructure. With NetFlow, network performance issues are easily resolved because engineers are given in-depth visibility that enables troubleshooting – all the way down the network to a specific user. The solution starts by presenting the interfaces being used. An IT engineer can click on the interfaces to determine the root cause of a usage spike, as well as the actual conversation and host pairs that are dominating bandwidth and the associated user information. Then, all it takes is a quick phone call to the end-user, instructing them to shut down resource-hogging activities, as they’re impairing network performance. IT departments are tasked with responding to end-user complaints, which often relate to network sluggishness. However, many times an end-user’s experience has more to do with an application or server failing to respond within the expected time period that can point to a Latency, Quality of Service (QoS) or server issue. Traffic Latency can be analyzed if supported in the NetFlow version. Statistics such as Round Trip Time (RTT) and Server Response Time (SRT) can be diagnosed to identify whether a network problem is due to an application or service experiencing slow response times. Baselines of RTT and SRT can be learned to determine whether response time is consistent or is spiking over a time period. By observing the Latency over time alarms can be generated when Latency increases above the normal threshold. TCP Congestion flags can also serve as an early warning system where Latency is unavailable. NetFlow application performance monitoring provides the context around an event or anomaly within a host to quickly identify the root cause of issues and improve Mean Time To Know (MTTK) and Mean Time To Repair (MTTR).